"This Strawberry-Cranberry Jam is delightful. It looks beautiful in a jar with a ribbon in a Christmas basket." In a large saucepan, combine strawberries, cranberries, pectin, and margarine. Bring to a boil. Stir in sugar, and return to a boil. Cook for 1 minute; remove from heat. Quickly fill jars to within 1/2 inch from top. Wipe rims clean, and put on lids. Process in a boiling water bath for 5 minutes. See how to make delicious homemade jam with cranberries and bananas. This jam is delicious. It's also convenient because it makes a large amount for many Christmas gifts. I used frozen strawberries and it turned out perfect! 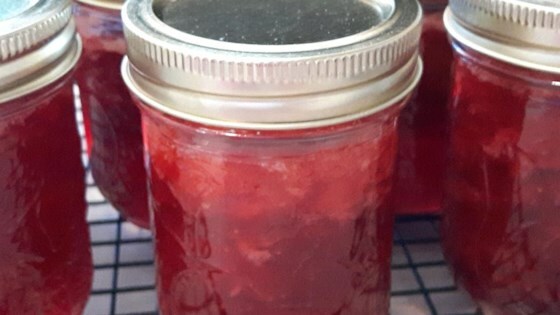 I made this jam for craft fairs and it was by far the best seller. Excellent for christmas giving. Tastes more like Strawberry than Cranberry.